Today at the Neutrino2014 conference in Boston, the IceCube collaboration showed an analysis looking for standard atmospheric neutrino oscillations in the 20-30 GeV region. 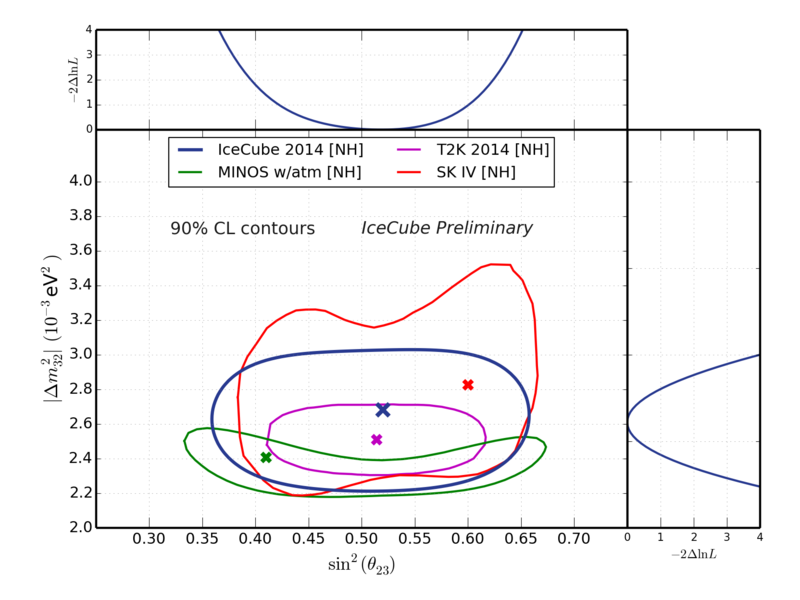 Although IceCube has seen oscillations before, and reported them in a poster at the last Neutrino conference, in 2012, this plenary talk showed the first analysis where the IceCube error bands are becoming competitive with other oscillation experiments. Neutrino oscillation is a phenomenon where neutrinos change from one flavor to another as they travel; it’s a purely quantum phenomenon. It has been observed in several contexts, including particle accelerators, nuclear reactors, cosmic rays hitting the atmosphere, and neutrinos traveling from our Sun. This is the first widely accepted phenomenon in particle physics that requires an extension to the Standard Model, the capstone of which was the observation of the Higgs boson at CERN. Neutrinos and neutrino oscillations represent the next stage of particle physics, beyond the Higgs. Of the parameters used to describe neutrino oscillations, most have been previously measured. The mixing angles that describe oscillations are the most recent focus of measurement. Just two years ago, the last of the neutrino mixing angles was measured by the Daya Bay experiment. Of the remaining mixing angles, the atmospheric angle accessible to IceCube remains the least constrained by experimental measurements. IceCube, because of its size, is in a unique position to measure the atmospheric mixing angle. Considering neutrinos that traverse the diameter of the Earth, the oscillation effect is the strongest in the energy region from 20 to 30 GeV, and an experiment that can contain a 20 GeV neutrino interaction must be very large. The Super Kamiokande experiment in Japan, for example, also measures atmospheric oscillations, but because of its small size relative to IceCube, Super Kamiokande can’t resolve energies above a few GeV. At any higher energies, the detector is simply saturated. Other experiments can measure the same mixing angle using accelerator beamlines, like the MINOS experiment that sends neutrinos from Fermilab to Minnesota. Corroborating these observations from several experimental methods and separate experiments proves the strength of the oscillation framework. 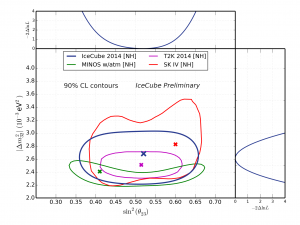 The sheer size of IceCube means that neutrinos have many chances to interact and be observed within the detector, giving IceCube a statistical advantage over other oscillation experiments. Even after selecting only the best reconstructed events, the experimental sample remaining still has over five thousand events from three years of data. Previous atmospheric oscillation experiments base analysis on hundreds or fewer events, counting instead on precise understanding of systematic effects. The IceCube collaboration is composed of more than 250 scientists from about 40 institutions around the world, mostly from the United States and Europe. 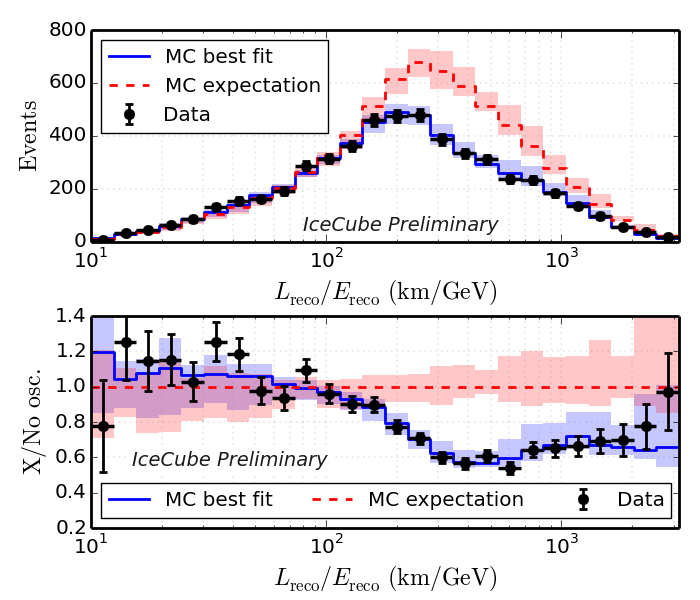 The current results are possible because of decades of planning and construction, dedicated detector operations, and precise calibrations from all over the IceCube collaboration. 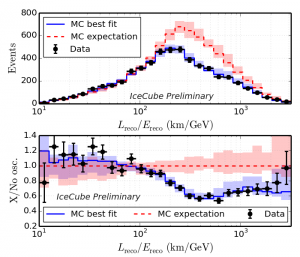 IceCube has several major talks at the Neutrino conference this year, the first time that the collaboration has had such a prominent presence. In addition to the new oscillations result, Gary Hill spoke in the opening session about the high energy astrophysical neutrinos observed over the last few years. Darren Grant spoke about the proposed PINGU infill array, which was officially encouraged in the recent P5 report. IceCube contributed nine posters on far-ranging topics from calibration and reconstruction methods to a neutrino-GRB correlation search. The conference-inspired display at the MIT museum is about half IceCube material, including an 8-foot tall LED model of the detector. One of three public museum talks on Saturday will be from (yours truly) Laura Gladstone about the basics of IceCube science and life at the South Pole. One new aspect of the new oscillation analysis is that it uses an energy reconstruction designed for the low end of the energy range available to IceCube, in the tens-of-GeV range. In this range, only a handful of hits are visible for each event, and reconstructing directional information can be tricky. “We took a simple but very clever idea from the ANTARES Collaboration, and rehashed it to tackle one of our biggest uncertainties: the optical properties of the ice. It turned out to work surprisingly well,” says IceCuber Juan Pablo Yanez Garza, who brought the new reconstruction to IceCube, and presented the result in Boston. By considering only the detector hits that arrive without scattering, the reconstruction algorithm is more robust against systematic errors in the understanding of the glacial ice in which IceCube is built.